AVES is a beautiful new deck of playing cards, printed by the world famous United States Playing Card Company, and Bicycle branded. 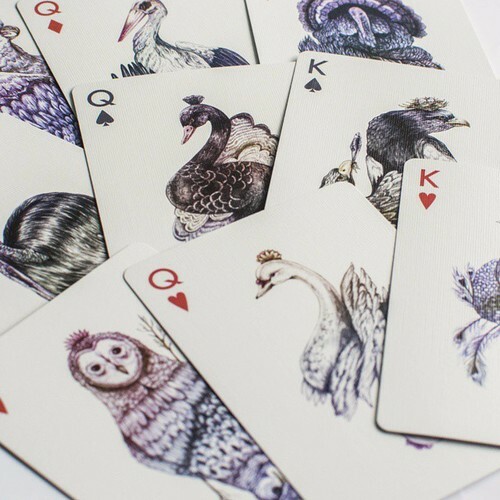 This stunning deck of cards is inspired by birds from the world over. AVES is hand-illustrated by artist Karina Eibatova and made into a custom deck of playing cards just for you. AVES is critically acclaimed, and appeared on art blogs everywhere online, including the famous "This is Colossal." AVES is completely playable as a normal deck of poker sized playing cards, featuring all 52 cards as well as two custom jokers, a double-back card, as well as one additional card.